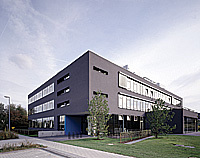 The laboratories of ChemBiotech are located in the Center for Nanotechnology, Münster, Germany. We have highly motivated chemists who are trained in organic chemistry, medicinal chemistry and chemical biology. The company has more than 500 publications and patents. ChemBiotech owns outstanding competence in the syntheses, modification and characterization of a diversity of nucleosides, nucleotides and DNA building blocks (phosphoramidites). Products of highest quality are our greatest concern. We cooperate with industrial and scientific institutions and perform contract synthesis. ChemBiotech uses its strong competence for own R&D projects and to the benefit of our customers. Our synthetic expertise provides solutions for your chemical and biological demands in nucleic acid, carbohydrate, and heterocyclic chemistry. We have skills and facilities in DNA research to meet the needs of our customers. Purity is verified to be > 98%. The identity is confirmed by 1H-NMR. The purity is verified to be > 98%. In many cases the compounds are characterized by 13C-NMR spectroscopy. The identity of the phosphoramidites is confirmed by 31P-NMR. The purity is verified to be > 98%. The UV-maxima and the extinction coefficients are determined and compared with reference data. The coupling efficiency of phosphoramidites is determined to be at least 98%.